The first trailer starts with a police car sitting on the side of a road in a town called Green Hills, just keeping an eye on traffic. Just then, a blue streak goes by and the gun reads 760 mph. The officer, played by James Marsden, can’t believe it. Cut to the Paramount logo which, instead of stars around the mountain, had gold rings. The camera is zooming down a street, then through a forest, as a tagline similar to “Every hero has a Genesis” graces the screen. The camera enters some kind of lair filled with a bunch of crappy worn out shoes. Back on the street, a blue being is stretching. 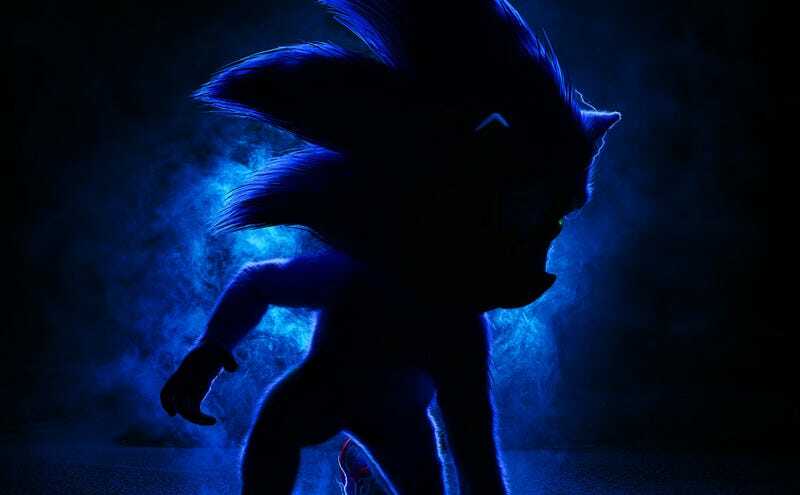 It’s revealed to be Sonic, who is probably about four feet tall, wears no clothing (save for his shoes) and has a well-defined—I almost want to say cute—face. He shoots off running, creating a huge explosion of energy. Cut to Sonic on the side of a building, a huge spaceship-looking thing shoots what seems like hundreds of guns at him with tons of bullets flying. But Sonic doesn’t sweat it. He just stands there, says “Oh look, I took nine million steps today,” and then starts disabling all the weapons in slow motion. The footage ends with a brief look at Jim Carrey as Dr. Robotnik who finds a blue strand of hair filled with electricity. Dr. Robotnik from Sega’s Sonic the Hedgehog 2. Wow. Okay. So, overall, Sonic the Hedgehog is a lot to take in. The character, at this point, doesn’t look great effects wise, but it’s certainly on the way to being kind of a charming, sci-fi sidekick in the mold of maybe Paul from Paul. He’s not quite E.T. but, I think that’s what they’re going for. Sonic the Hedgehog is set for a November 8 release.